Giant dairy co-operative Fonterra has again hiked its forecast milk price for farmers - to $5.25 - from the previous $4.75 per kilogram of milk solids. The forecast, coming a day before Fonterra releases annual results, is something of a surprise as it immediately follows a GlobalDairyTrade auction that saw only fairly moderate results. When combined with the forecast earnings per share range for the 2017 financial year of 50 to 60 cents, the total payout available to farmers in the current season is forecast to be $5.75 to $5.85 before retentions. Returns of something in the $6 range are seen as necessary to be sustainable for farmers. But there's no doubt prices are now moving in the right direction after two seasons of depressed earnings. Fonterra's opening pick for a milk price this year was only $4.25. This was boosted to $4.75 only as recently as August 25 and has now been lifted again. Chairman of Fonterra John Wilson said that since the August review of the forecast milk price, global milk supply had continued to reduce, and demand had remained stable. 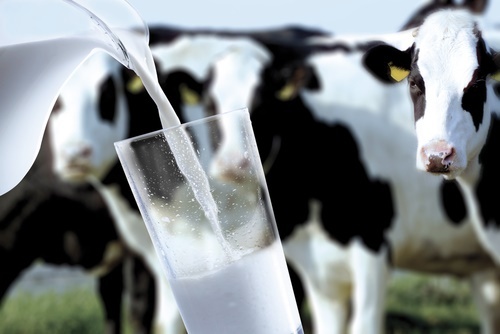 "Milk production in key dairying regions globally is reducing in response to low milk prices. Milk production in the EU for 2016 is beginning to flatten out and our New Zealand milk collection is currently more than 3% lower than last season. "While we have seen some improvement in GDT auction prices recently, the high NZD/USD exchange rate is offsetting some of these gains. "There is still volatility in global dairy markets and we will continue to keep our forecast updated for our farmers over the coming months," Wilson said. Being picky but that headline isn't correct. That is the total available to pay, surely there will be retentions. Thanks. Have now added "before retentions" into headline for clarity. I hope the retentions are wisely used in productive assets and debt reduction .............. not more waterfront glass towers. The widely held view of farmers in the local taverns across New Zealand is that the only thing Fonterra's Auckland Head Office produces are expensive luxury Company cars from the basement parking at 4.30 each day . been saying for years why do they need to be Auckland to start with, most expensive city in NZ . I take with a grain of salt any price increases before Christmas. They appear to engage in disruptive practices with early season payout announcements. Didnt they need $3000 a tonne for WMP last year to hit the $4.60 mark. Baffling. Wiser than me have suggested it not about the 50cents - it is about the timing. Being the day before the annual profit announcement. If the dividend is at a record high as expected then some farmers will be outspoken on having to share the proceeds with the unit holders and their comparatively high return on assets. It's all about keeping the masses oblivious while they shaft us another way. I think it's about trying to keep the momentum of good news going for dairy farmers. Dead right there - keep the expectation of a good result going, so when 'we' (the Fonterra Board) introduce legislation to remove farmer voting power on the Board the farmers roll over and submit. Wise farmers will keep their budgets tight, but there are a lot of farmers out there paying huge money for cows at this time, so the strategy is working!